Bengkung is a traditional Malaysian belly binding method. Essentially it is a practice of tying a long strip of cloth around the abdomen during the postpartum recovery period to ensure a strong support to your womb after childbirth. What makes a Bengkung different from western postpartum girdles and waist trainers? It’s the length and breathable material! A Bengkung Belly Bind is a long wrap made out of 100% cotton, that covers from under the chest all the way down to the hips. This way, it doesn’t just work on the waist, but also helps the ribcage and the hips go back to their former dimensions. It also moves with you and it doesn’t press on the abdomen or cause constriction. How long should the Belly Bind be worn? 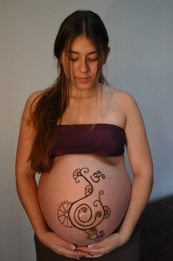 Traditionally the Belly Bind is worn every day for 40 days postpartum starting on day 3-4 after birth. Although it is most effective and best if used during this time, it can be helpful for support during anytime of the postpartum period.